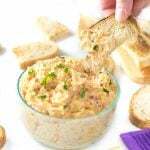 This Hot Reuben Dip is perfect for your next party! It packs the tangy and delicious flavors of a Reuben sandwich into a creamy and cheesy dip! Combine all ingredients, minus crackers/bread, into saucepan and heat till melted. Stir occasionally. It is ready to serve when all ingredients have melted together. Serve hot with toasted rye bread or crackers. You can use a slow cooker as well to heat this up and serve it. Expect it to take 1 1/2 hours or longer to heat up. IF YOU LIKED THIS RECIPE you will LOVE my Classic Taco Dip recipe!